The western media is ahoy with news of Five Planets Visible in Morning Sky at a time. 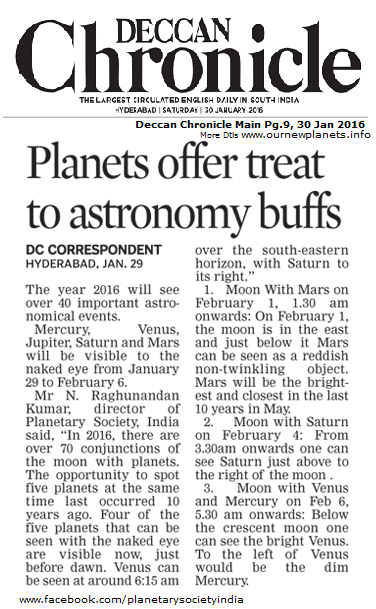 This kind of opportunity to spot Five planets at same time in the sky last occurred 10 years ago. Like a busy urban family, planets rarely get together all at once. Four of the five planets that can be seen with the naked eye are visible now, just before dawn. Venus can be seen at around 6:15 a.m. over the south-eastern horizon, followed by Saturn to its right. It is followed by orange-red Mars, about 45 degrees over the southern horizon and Jupiter, about 35 degrees over the south-western horizon. 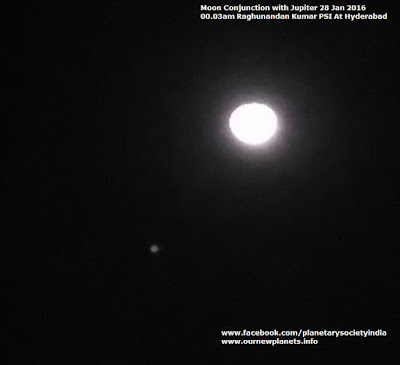 Moon With Jupiter on 28 Jan: Moon was in Conjunction with Jupiter. For next two days looking East 9.30 pm onwards before midnight and West in Early morning hours Jupiter can be spotted as non-twinkling bright star like object. Moon With Mars on 1 Feb 2016 1.30 a.m. onwards - East : Right now Planet Mars is all up to catch up with Earth for its May 2016 faceoff. On 1st Feb if one looks East Direction one can find Moon and just below that one can find Planet Mars as Reddish Non-Twinkling Object. However Mars can be spotted all through the year till end. However Mars would be brightest, closest, biggest in last 10 years in May 2016. Moon with Saturn on 4th Feb 2016 3.30 a.m. onwards: looking East from 3.30am onwards one can locate moon and just above on right of moon one can spot non-twinkling golden color object which is Saturn. Moon with Venus and Mercury on 6th Feb 2016 – 5.30 a.m. onwards: Further after locating Crescent Moon if one look below it one can see very bright Venus. And on to the left of Venus would be dim Mercury.